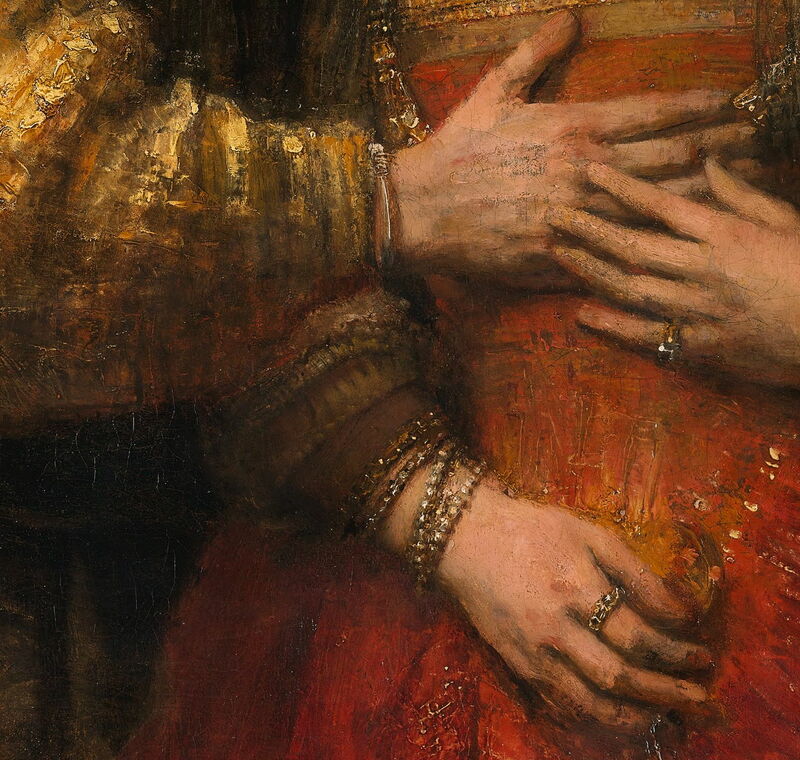 Rembrandt Harmenszoon van Rijn (1606–1669), The Jewish Bride (detail) (c 1667), oil on canvas, 121.5 x 166.5 cm, Rijksmuseum Amsterdam. Wikimedia Commons. The great majority of paintings which form the fabric of art history were painted using oil paints. In its day, egg tempera was used for many masterpieces, but once oil painting became established practice, tempera became relatively little-used. Watercolour has been used with huge success, but professional painters recognise that its paintings do not live as long as those in oils. For the half millenium or so prior to the development of modern acrylic paints, oils have been the most important medium in painting in the western world. As Spike Bucklow and others have observed, the practice of oil painting is a form of alchemy, and for much of the history of oil painting, materials and techniques have been treated as if they were alchemy. Even today there are books and vendors which promise to somehow offer or reveal ‘the secrets of the Old Masters’, as if they could transform an artist’s work in some mystical, alchemical way, like transforming base metal into gold. Surprisingly, the influence of oil paints on art history has not been given the prominence which it deserves. It is generally accepted that many of the great achievements of Renaissance painting were the result of switching from tempera to oils, but art history now seems more concerned with matters such as patronage, critical reception, and art theory than the more fundamental issues of technology and technique. As a result, many of the old fallacies surrounding the history of oil painting have lived on. Many still assume that, although Vasari’s claim that the van Eyck brothers ‘discovered’ oil painting is false, the van Eycks were somehow the first artists to use oils in any sophisticated way, such as using glaze layers, and that oils were at that time still quite novel. I have, I hope, already set the record clear on the ancient origins of oil painting in Europe in this article. There are similar fallacies held more widely about more recent developments in oil painting, such as its use in outdoor or plein air work, and the importance of the invention of paint tubes, which I tackled in this article. What has been seldom attempted is to give an account of the history of oil paints and their use in (fine art) painting: that is what I will try to cover in this series of articles, starting with this overview. Tracing this history is not easy. There are remarkably few professional painters who have left clear accounts of their materials, preparation of their paints, and how they used them in their paintings. For most of the period we are interested in, those have been closely-guarded secrets, either because of the requirements of the Guild of Saint Luke (or equivalent group) to which they belonged, or because of their own professional secrecy. There are many written accounts of these matters, going right back to the dawn of oil painting, but most appear not to be particularly reliable, and the recipes and techniques which most quote are usually being passed on at second or even third hand. Physical examination of paintings has become a prominent feature through the twentieth century, but has not always been treated with the scientific rigour which it requires. Experience with various methods used has usually shown that they are neither as reliable as was originally thought, nor do they yield the insights which were expected. Research into the chemistry of oil paint, and its drying process, has only recently brought much improved understanding, as I explain here. Most recently, a few researchers have been trying to reproduce the materials and techniques which have been claimed to be used. This has enabled them to cast doubt on, or to confirm, some of the written accounts, against the results of physical examination. This area is particularly promising. The property of certain vegetable oils to ‘dry’ into durable layers was observed in ancient times, and some very old paintings appear to have used this in their paint layers. However, it was not until about 1180 that drying oils appear to have been used with sophisticated layered techniques to produce works of art. Earliest examples come from the island of Gotland, Sweden. 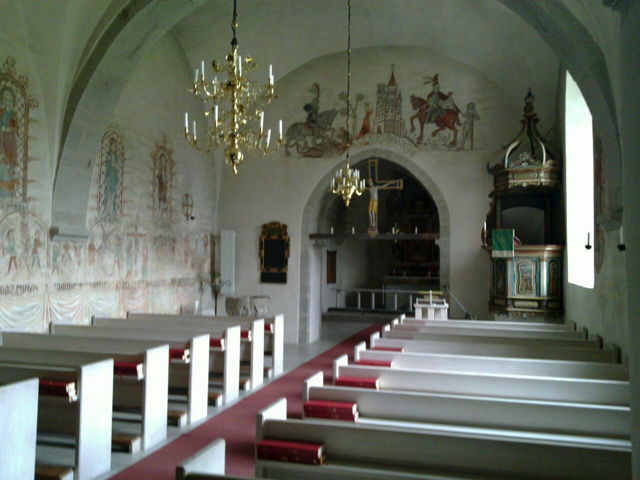 Triumphal Crucifix (at back), Hemse Church, Gotland, Sweden. By Karl Brodowsky (CC BY-SA 3.0), via Wikimedia Commons. Very few substantial paintings from the period 1100-1500 have survived to modern times, but those that have show that these techniques were used throughout much of Europe. For example, the Westminster Retable (in Westminster Abbey, London) dates from about 1275, and despite being broken up and turned into furniture in the past, was clearly painted in oils using techniques as sophisticated as those around 1500. The Thornham Parva Retable, probably made for a priory in Thetford, England, is a better-preserved example thought to date from 1336-40, slightly later than the painted altar front of the church at Tingelstad in Norway (1300-25). Jan van Eyck (c 1390–1441) and Hubert van Eyck (c 1366-1426), The Ghent Altarpiece (c 1432), oil on panel, open overall 350 x 461 cm, Saint Bavo Cathedral, Gent, Belgium. Wikimedia Commons. 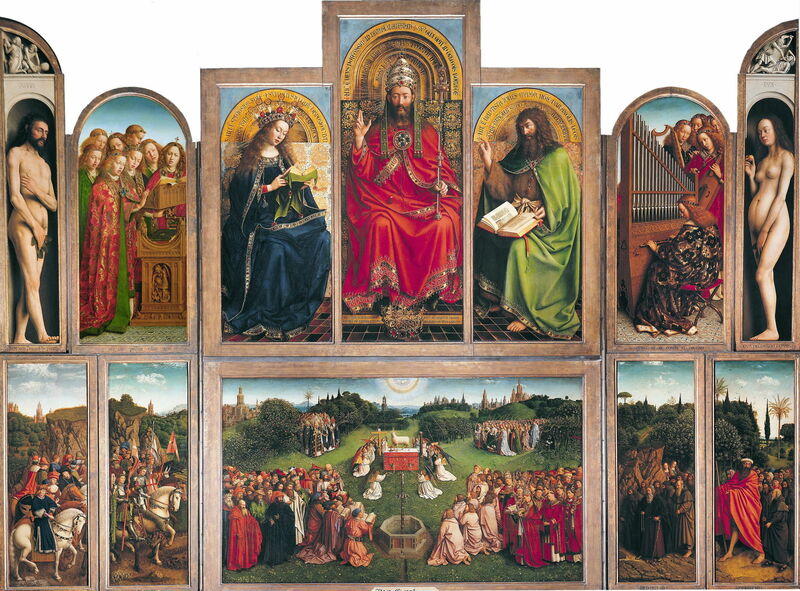 The northern European tradition of oil painting reached a peak in the work of Jan van Eyck (c 1390–1441) and his older brother Hubert van Eyck (c 1366-1426), as shown in their magnificent Ghent Altarpiece (c 1432). 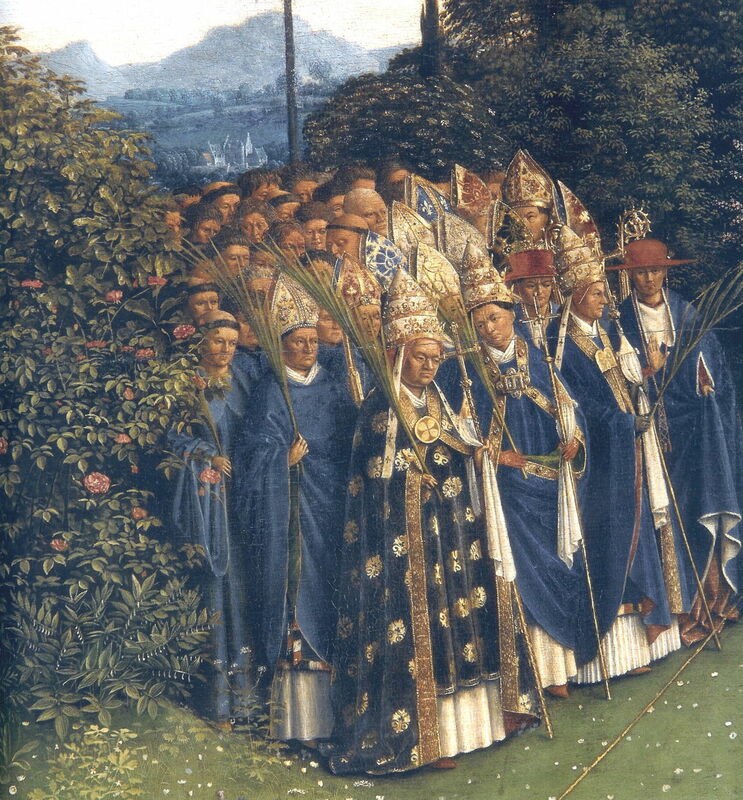 Jan van Eyck (c 1390–1441) and Hubert van Eyck (c 1366-1426), The Mystic Lamb, part of the Ghent Altarpiece (detail) (c 1432), oil on panel, open overall 350 x 461 cm, Saint Bavo Cathedral, Gent, Belgium. Wikimedia Commons. As this detail shows, they were able to model faces, fabrics, and forms in fine detail. Furthermore their meticulous workshop practice ensured that their paintings have survived well for nearly six hundred years. Oil painting came later to the southern Renaissance, and its adoption was more gradual too. Among its great innovators was Leonardo da Vinci (1452–1519), but his innovations were not always successful. 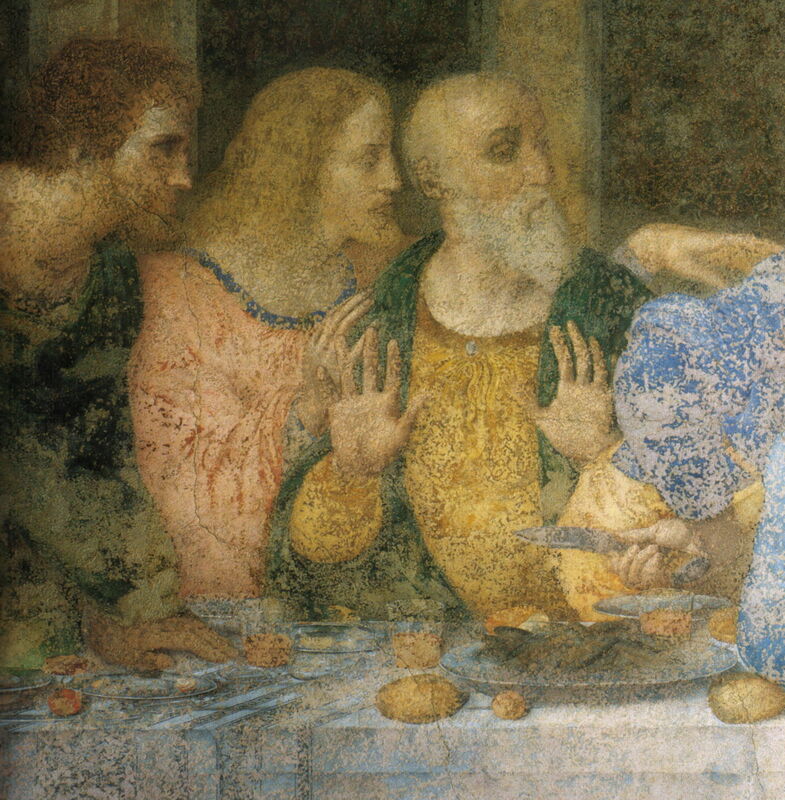 Leonardo da Vinci (1452–1519), The Last Supper (detail) (1498), mixed oil and tempera on plaster, 460 x 880 cm, Convent of Santa Maria delle Grazie, Milan. Wikimedia Commons. His masterpiece The Last Supper (1498) mixed oil and tempera on plaster in a manner (and on a highly problematical support) which resulted in rapid deterioration. 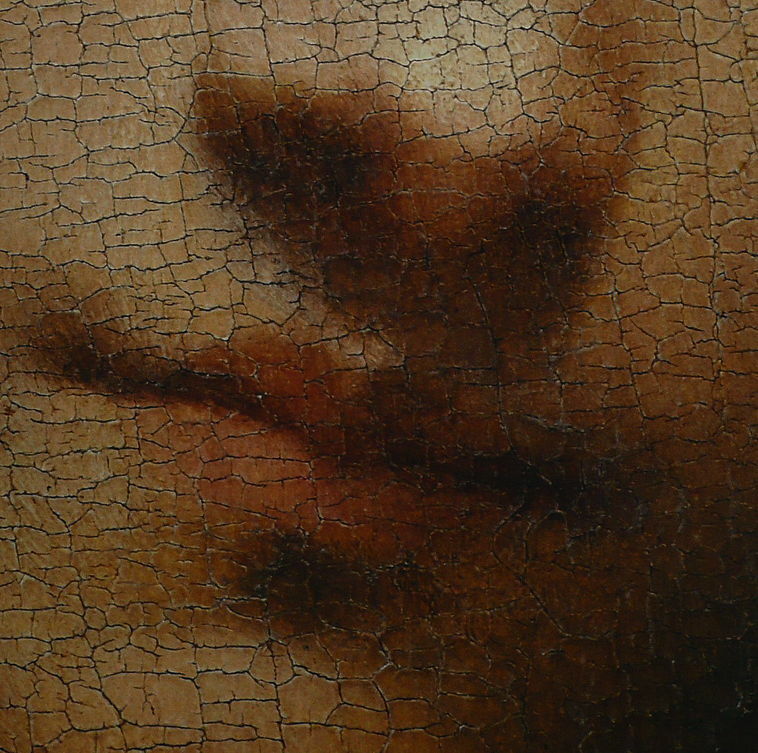 Leonardo da Vinci (1452–1519), Mona Lisa (detail) (1503-1506), oil on poplar wood, 77 x 53 cm, Musée du Louvre, Paris. Wikimedia Commons. 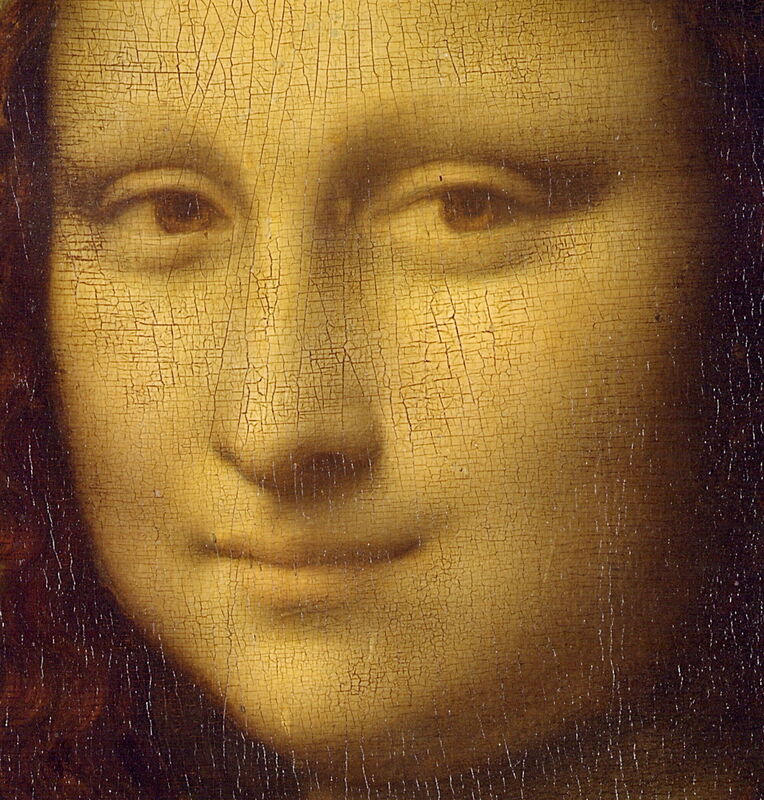 When working on better-proven supports, such as wood panels, in the Mona Lisa, he was able to paint wet-into-wet to achieve his famous sfumato. Giorgione, Ragazzo con la freccia, c 1500 (detail), oil on panel, 48 x 42 cm, Kunsthistorisches Museum, Vienna. Wikimedia Commons. Others, such as Giorgione, developed their own techniques which also relied on the slow-drying of oil paints. From the earliest use of oil paints, it must have been noticed that they can dry perfectly well when heaped up, rather than spread out in thin layers over the ground. But it was not until the later years of Rembrandt’s career that significant use was made of impasto and gestural ‘mark making’. Even then many of his contemporaries criticised him for doing so, and most painters up to the 1800s refrained from leaving the paint surface ‘unfinished’. Until the late 1700s, in common with other supplies such as panels and canvases, it was the artist’s studio which was responsible for making its own paints and mediums. Ingredients such as linseed oil, resins, solvents, and pigments were bought in from suppliers – who were often pharmacists as well – and assistants would make them according to need, using in-house formulae. 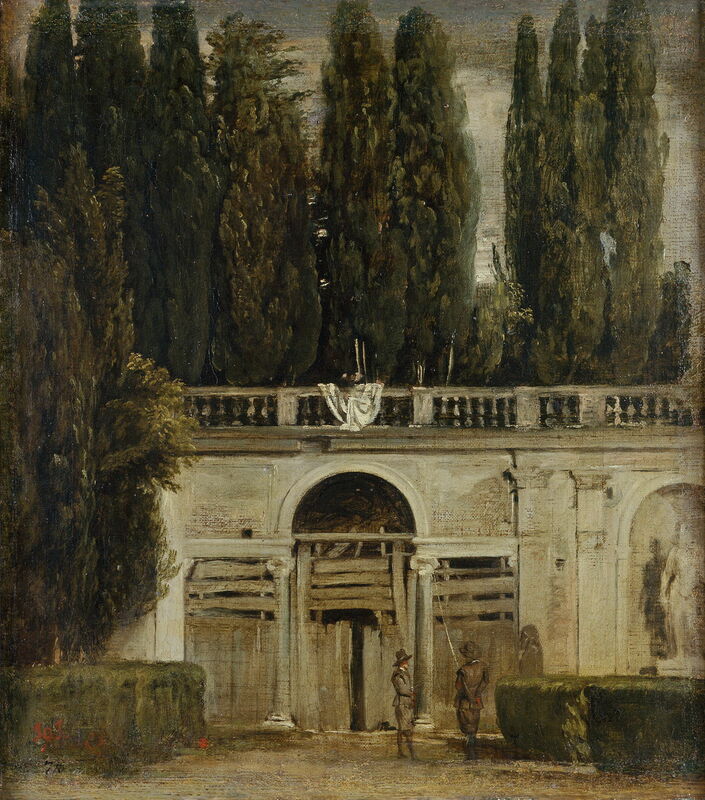 Diego Velázquez (1599–1660) View of the Garden of the Villa Medici (c 1634), oil on canvas, 48.5 × 43 cm, Prado Museum, Madrid. Wikimedia Commons. Painting in oils far from the studio became possible when paints were placed inside animal bladders for transport. Until then, artists normally used more portable water-based paints and inks when out sketching. This landscape by Velázquez may have been one of the first to have been painted outdoors using oil paints – a practice which developed more widely in the late 1700s, and enabled landscape artists to create studies and even finished works largely in front of the motif. Sir Lawrence Alma-Tadema (1836-1912), Sappho and Alcaeus (detail) (1881), oil on panel, 66 x 122 cm, Walters Art Museum, Baltimore, MD. Wikimedia Commons. 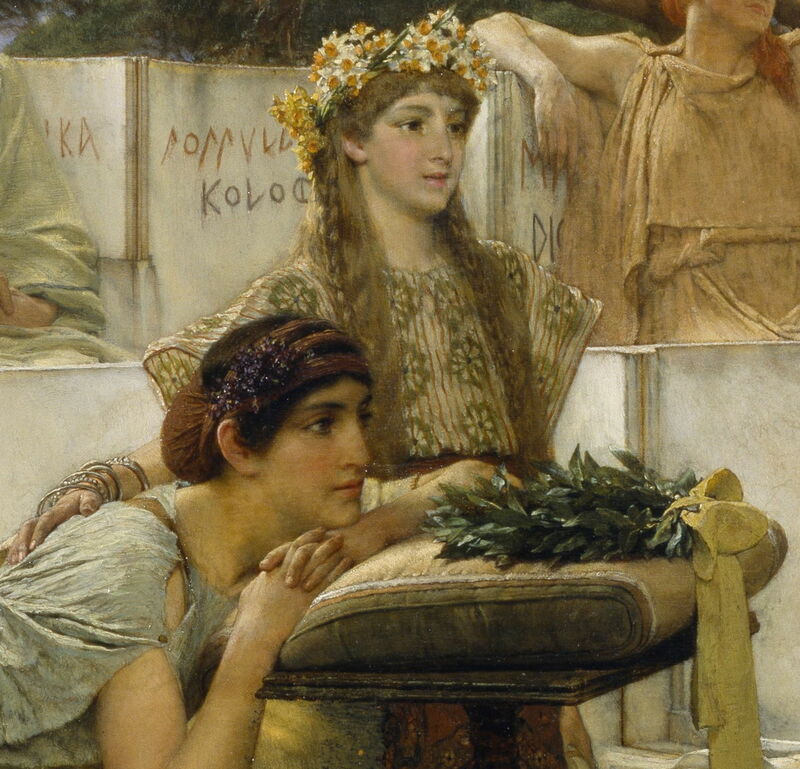 Increasing diversity in the techniques of oil painting has still not supplanted traditional studio techniques, which originated long before the van Eyck brothers, as seen in this detail from Sir Lawrence Alma-Tadema’s Sappho and Alcaeus (1881). Modern oil paints may be made in a factory and incorporate all manner of novel chemical additives to adjust their properties, but they are still used for glazing and opaque layers, scumbling, and wet-in-wet. The twentieth century has added the use of alkyd resins, water-miscible oil paints, and more, but painting in oils is still alchemy at its heart. Posted in General, Painting, Technology and tagged Alma-Tadema, da Vinci, Giorgione, history of painting, oil paint, oil painting, painting, Rembrandt, van Eyck, Velázquez. Bookmark the permalink.